XL426 made her final flight from RAF Scampton to Southend Airport on December 19th, 1986. It was in the hands of Squadron Leader Paul Millikin (captain); Squadron Leader Neil McDougall (co-pilot); Squadron Leader Ken Denman (air electronics officer); Squadron Leader Dave Moore (navigator radar), and; Squadron Leader Ray Leach (navigator plotter). Chief Tech Dave Thorpe (crew chief) was also on board for the flight. The aircraft was formally struck-off RAF charge three days later and ownership passed to Roy Jacobsen, who had plans to return XL426 to the sky as a civilian display aircraft under the auspices of the Vulcan Memorial Flight. July 7th, 1987, saw XL426 entered on the UK civil aircraft register as G-VJET. 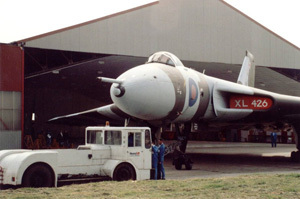 XL426 was Roy Jacobsen’s second Vulcan, having purchased XM655 two years earlier. 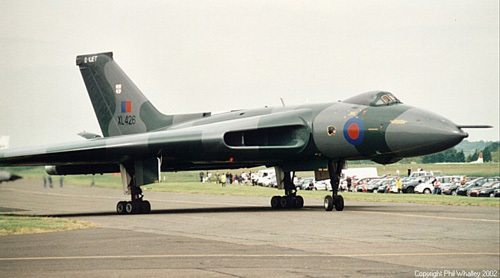 XM655 was based at Wellesbourne Mountford airfield in Warwickshire, where the short length of the runway and the reluctance of British Aerospace to provide any formal backing to the project, meant she was effectively stranded. XL426 offered new hope. Southend-based HeavyLift Aircraft Engineering had indicated that they would be willing to provide engineering support for XL426. However, this would be on a strictly commercial basis and Roy was never able to raise the sums needed for the necessary engineering work to be carried out. 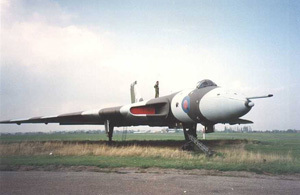 1990 saw the formation of a supporters club for the aircraft – the Vulcan Memorial Flight Supporters Club (VMFSC) – which began campaigning to raise funds to restore XL426 to airworthy condition. The Club commissioned British Air Ferries (also based at Southend) to carry out an airframe survey which indicated that, despite four years of outside storage, a restoration to flight was still possible. 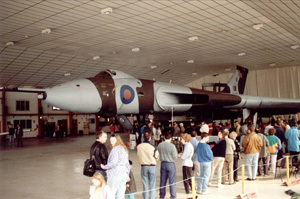 Easter 1991 saw the aircraft opened to the public for the first time since arriving at Southend, inside one of the BAF hangars, as part of the Club’s fundraising campaign. Up until that time, XL426 had been parked in full view of the Southend terminal, initially on the main apron but latterly on the grass at the rear of the apron. From 1991, XL426 found a new home at the northern end of Southend’s disused runway, well out of public view. Here she was free from airport parking charges and an embryonic engineering team began carrying out regular, albeit basic, preservation work. Ownership of XL426 transferred from Roy Jacobsen to the VMFSC in July 1993; Roy gifting the aircraft to the Club after it had paid off £8,000 of the aircraft’s parking debt owed to Southend Airport. The VMFSC then reformed as the Vulcan Restoration Trust (VRT) prior to achieving registered charity status in 1996. The VRT continued with the ultimate aim of returning XL426 to the sky but also set itself an intermediate, and more achievable, aim of restoring XL426 to full ground running condition, whereby its engines could be run regularly and the aircraft taxied on Southend’s runway. 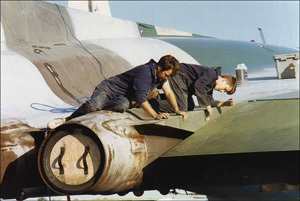 Derek Potton, a then British Airways Concorde engineer, had for some time been restoring XL426’s electrical systems to working order. He was joined by Trevor Bailey, a young engineer then working for HeavyLift, who set about bringing the XL426’s engine and airframe systems back to life. March 1994 saw all four engines dry-cycled (the first time they had been run since 1990 as part of the BAF airframe survey), followed shortly by the running of the No.2 and then all four engines. 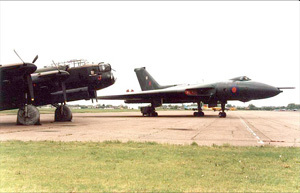 1994 also saw the aircraft repainted for the first time since leaving the RAF. The following year saw XL426 move from the end of the disused runway to its present home, a purpose-built pan on the airport’s eastern perimeter, adjacent to the London to Southend railway line, where the aircraft was more visible to the public visiting the airport’s flying clubs. Work continued to get XL426 back to taxying condition, this bearing fruit on October 7th, 1995, when XL426 moved under her own power for the first time since arriving at Southend. Squadron Leader Joe L’Estrange and Captain Roger Frampton were at the controls for a slow speed ‘trundle’ along approximately 500 yards of the disused runway. Further work was required before XL426 could venture out onto the active runway and begin high-speed taxy-runs. 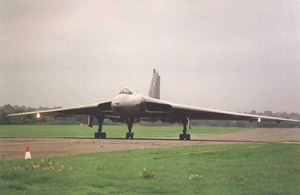 This feat was achieved in early 1997, a slow-speed run on the active runway being the precursor to the first high-speed run in March, with Group Captain Bill Burnett as captain. The first public high-speed taxy-run, complete with braking parachute, took place at the Airport Open Weekend held over the 1997 Spring Bank Holiday; this time with Squadron Leader John Reeve in charge. Just over ten years since a shabby XL426 whistled over the airport perimeter to begin her retirement, the VRT had achieved the extraordinary; XL426 was a fully live airframe once again. Ultimately, the VRT relinquished its ambition of restoring XL426 to airworthy condition, choosing instead to concentrate on maintaining the aircraft in full ground running order. Achievements since 1997 have been less dramatic but no less demanding or challenging. The Engineering Team has grown into a regular cadre of 15 or more volunteers, now lead by Matt Lawrence, and the engineering work on XL426 has increased in both its depth and scope. This has been recognised by the British Aviation Preservation Council, which classifies XL426 as a ‘benchmark’ example of its type. The VRT has continued to increase its stock of spares and, in 2000-01, XL426 underwent its second full repaint. In 2002, the VRT move into its own permanent workshop at the airport and also enlarged and resurfaced XL426’s dispersal pan. 2002 also saw the VRT celebrate the 50th anniversary of the Vulcan’s first flight with a special Open Day on August 31st that featured two high-speed taxy-runs. XL426 performing taxy-runs at Open Days, and also for filming and engineering purposes, was a regular sight at Southend in the period from 1995 to 2005. Following the taxy-run at the Open Day in August 2005, the VRT took the decision to withdraw XL426 from taxying ‘service’ to carry out a programme of in-depth restoration and repair work. This programme, known as Return to Power, will see XL426 return to high-speed taxying condition and it a fit state to survive for many years to come at Southend.